Founded by Anagarika Dhammapala, the Maha Bodhi Society is a South Asian Buddhist society. The organization’s initial efforts were to restore various Buddhist shrines that had been neglected under Hindu administration, and to open to the public various Buddhist sites and temples that had been destroyed in various periods of Muslim invasion. Their efforts involved Mahabodhi Temple at Bodhgaya and the site of the Buddha’s parinibbana (physical death) at Kushinagar. The latter site has once again become a major attraction for Burmese Buddhists, as it was for many centuries previously. Maha Bodhi Society branches have been established in several countries, most significantly in India and Sri Lanka. A United States branch was founded by Dr. Paul Carus. The Maha Bodhi Society has a robust tradition of publications, spanning from Pali translations into modern Indian vernacular languages (such as Hindi) to scholarly texts and new editions of Pali works typeset in Devanagari to appeal to a Hindi-educated Indian audience. They have also published books and pamphlets in local/regional languages and dialects, sometimes in partnership with other presses. As of 2003, the Maha Bodhi Society of India’s general secretary is Dombagoda Rewatha Thero. On September 27, 2004, B. K. Modi was elected president; he was previously vice-president. Modi was, until recently, an office-holder in the Vishwa Hindu Parishad. 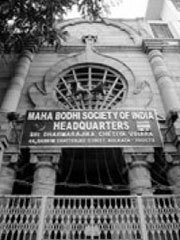 There is also a Maha Bodhi Society of Bangalore, founded by Acharya Buddharakkhita in 1956, which is not a part of or tied to the Maha Bodhi Society of India or Sri Lanka.